Teri McD made this youtube video a couple years ago. But it still rings true today. It demonstrates a springtime reversal. Reversals are important to help expand the brood nest. This promotes greater egg laying by the queen, leading to a more populous hive. We can then possibly divide the colony in early to mid May. While the spring of 2013 is still cold and pollen is probably a week to two weeks in the future, a reversal of overwintered colonies helps a colony expand and flourish. The colony should be at least five or six frames of bees to do a reversal and the daily temperatures should be in the 50's. Pollen patties should be placed on the top bars of every box with bees in them. This helps to make sure the bees are getting protein to the brood. 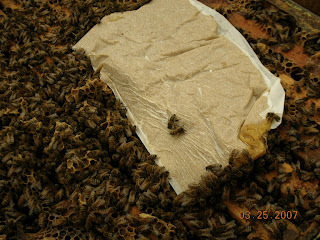 MN Beekeeper has spring bee loss, Is it pesticides? With the warmer weather upon us. Dead hives should be cleaned out of dead bees. Clean off the bottom board, go through the frames and brush of any loose bees. Close up the hive bee tight, to prevent robbing of any existing honey. The honey can be used to feed the new package bees. The bees have been plodding along waiting for some warm weather. When it stays cold like this it does impact the bees. The bees can't expand their cluster and their numbers won't increase dramatically until we get out of this icebox. Honey consumption has increased with the increase in brood production. Right now there should be at least two frames of brood in the colony. Larger clusters of bees may have more. The cold weather has the bees working hard keeping the brood warm. Pollen patties are being consumed more readily because the bees can't get any stored pollen from any parts of the hive because of the cold. Beekeepers should be checking patties weekly to make sure there is pollen always available. Pollen patties will have to be fed longer than usual this year. The cold weather has put all growing plants in no growth mode. We may not have any hints of pollen until mid April at the earliest. I have talked to Ray my package bee supplier. He still has not given me any delivery dates yet.We are going to talk again this weekend to see how things are progressing. I understand that some beekeepers have a tight schedule to fit the package bee delivery in. Hopefully I can have some dates soon. 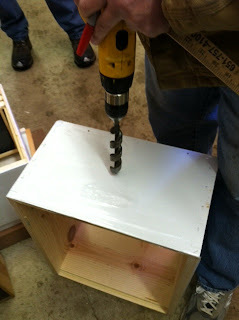 I drill holes in all my deep hive bodies for a future winter entrance. You never know which box will end up on top so a one inch hole in all the brood boxes is a necessity. I use a one inch auger bit. I like that style of drill the best. 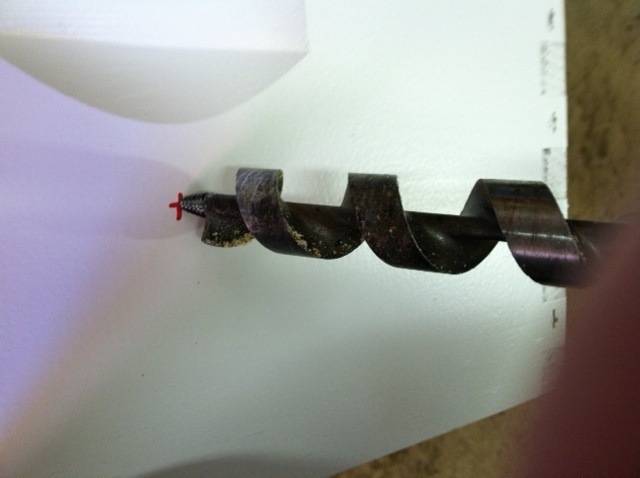 It has a screwed tip that pulls the drill through the wood. A strong drill is required and a strong grip on the drill. I use an 18 volt Dewalt battery drill on the slowest setting. 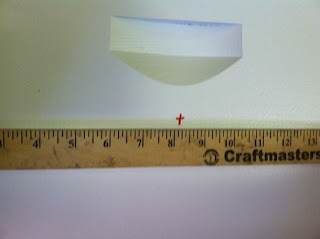 The hole is drilled on the short side, in the center of the side, one inch below the handhold. The cold weather is hanging on refusing to leave. It looks like the next week is still more of the same. I am leaving my black winter boxes on until the temps are in the 40's on a steady basis. Going out to one of my bee yards I lifted up all the top boxes an inch off the lower box to get an idea if the bees needed feed or not. One of the colonies very light on stores and I started feeding them sugar water or they would be dead in a week. The other colonies were still good on honey stores. A quick peek under the inner cover, if the cluster had no honey near them, I moved a frame of honey next to the cluster being careful not to move the cluster of bees. All of the colonies got a pollen patty. This time of year I only feed if the bees are low on stores. Right now a colony should have a bee strength of four frames of bees. If a colony has two frames or less of bees they are very weak and will not mature into a healthy colony. Hopefully this cold weather will make a quick exit soon. The average high temperature this time of year is in the forties. 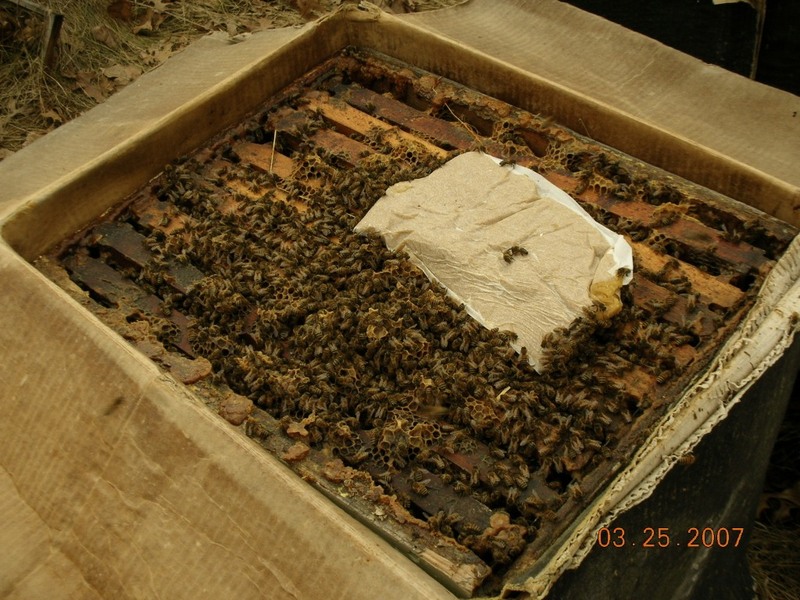 It is time to put pollen patties on the over wintered colonies. The patties are usually placed on the top bars just under the inner cover. The location is always determined by where the bees are. Patties are placed right on the bees. I am sold out of package bees. Anyone that sent me an order through last week or postmarked today, Monday, is included on the second delivery of bees. Mann Lake Ltd is still taking orders for package bees.